Score steak with a sharp knife so marinade can penetrate meat. Mix salt, onion powder and crushed garlic together and rub into steak evenly. Whisk together lime juice, TABASCO® Original Red Sauce and 2 teaspoons honey and pour into a plastic resealable bag with meat. Place in fridge and marinate overnight, or at least two hours. Mix together cabbage, carrots and spring onions and set aside. To prepare the dressing, stir together yogurt, TABASCO® Chipotle Sauce, cilantro, lime juice, and remaining honey; add salt to taste and set aside. Grill steak on both sides until cooked to your required doneness. Remove from heat and allow to rest for 3 minutes, then cut into thin slices. To assemble tacos, first heat tortillas in a dry pan and heat through. 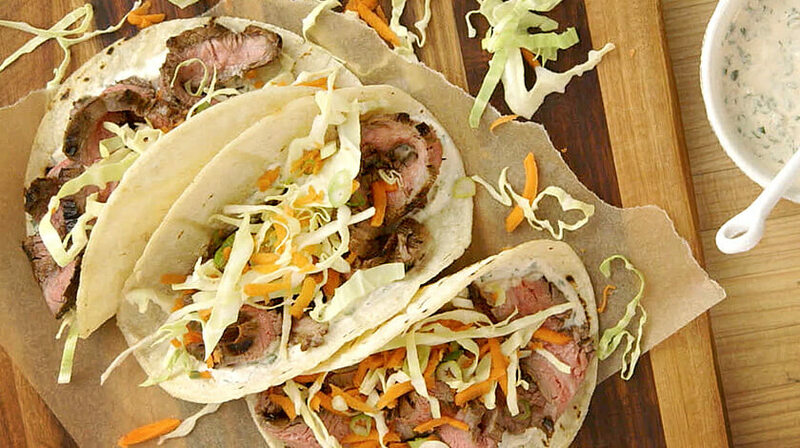 Transfer to plate; place some cabbage mixture onto a tortilla, then top with some steak and a drizzle of Chipotle-yogurt dressing. Serve immediately.